How well do you know your fireshed? and you're invited to participate! This event has passed. Use the links below to access the presentations and check back for more events like this in the future! 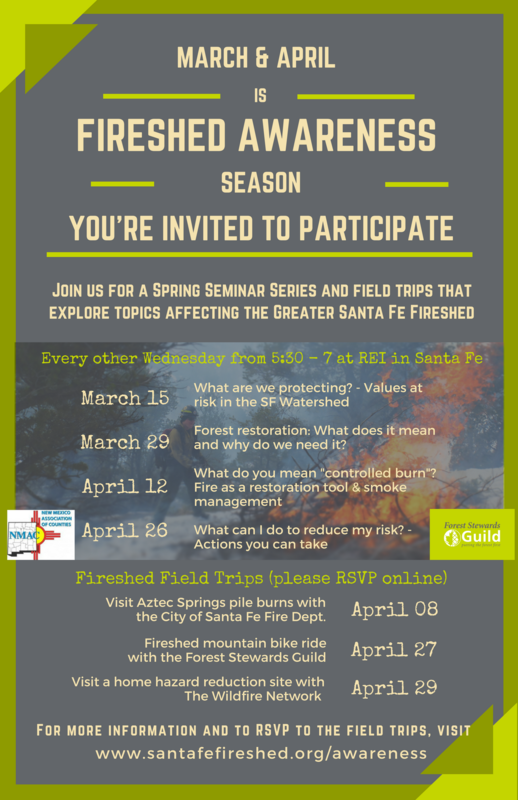 The Forest Stewards Guild with help from partners, and funding from the New Mexico Association of Counties, brings you a FREE Spring Seminar Series that is designed to lead you through an interactive, participatory learning experience about the Greater Santa Fe Fireshed. Every other Wednesday March 15th - April 26th there will be an evening seminar held from 5:30 - 7 at REI in Santa Fe that focuses on topics affecting our fireshed. Speakers will address issues such as, the impacts a wildfire would have on economy, culture and tourism; what does it mean to restore a forest; the role of fire in the forest ecosystem; smoke management; programs available that will help you reduce your risk from wildfire, and much more. There will be time for discussion, questions and community announcements after each seminar. Participants are invited to continue their conversations at Second Street Brewing at the Railyard following each seminar. Participants are encouraged to attend as many of the four seminars as they can. Each seminar will address a new topic and may integrate discussions or ideas from the previous topic. Three field trips will integrate the seminar discussions and lessons into fun, interactive day trips into the fireshed, led by forest and fire professionals. Please RSVP if you would like to attend a field trip. Seminar Series every other Wednesday through March and April at REI! 5:30 - 7pm, REI community room. Explore the impacts wildfire would have on the economy, tourism and culture of Santa Fe and the surrounding area from recreation, Tribal and water resource professionals. Discuss with your peers what you value about the Greater Santa Fe Fireshed and how a wildfire would impact you or your business. Water resources - Alan Hook, City of Santa Fe Water Resources Div. Tesuque Pueblo and cultural values at stake - Ryan Swazo-Hinds, Tesuque Pueblo Environment Dept. Forest restoration: What does it mean and why do we need it? Learn about forest and fire ecology from a local USGS scientist. 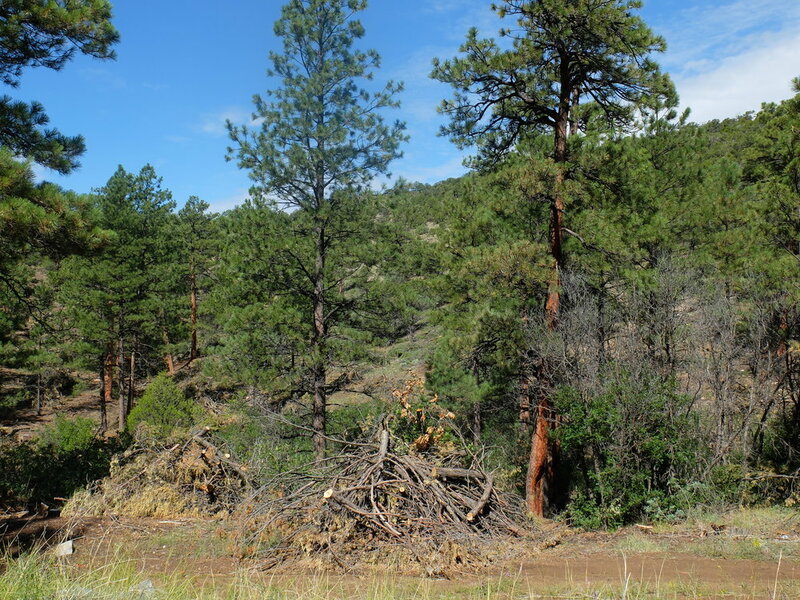 Understand what it means to restore a forest and hear about current thinning and restoration projects in the fire shed from the City of Santa Fe Fire Department's Wildland Urban Interface Specialist. 6:10 - 6:35 Why is forest restoration needed? Active forest restoration projects in the fireshed - Porfirio Chavarria, City of Santa Fe Fire Dept. There are programs available to help you reduce risk of wildfire on your property. Hear about a cost-share opportunity to help you reduce fuels on your property. Learn how to conduct your own home wildfire risk assessment and bring home a booklet that will walk you through the steps. Find out about an ambassador program offered from the City of Santa Fe that will help you reduce your risk. Fireshed mountain bike ride with the Forest Stewards Guild. Bring your bike, helmet and water. Moderate difficulty, some uphill on the lower Windsor trail required. TIME: 5:30 - 7:30 | MEET UP: Bear Wallow trail head @ 5:30. Sign me up for the Mountain Bike ride in the Fireshed. I can shred any terrain! Wildfire risk home assessment training and defensible space tour.